Internationally published, Brooklyn-based boutique interior design & decorating firm. 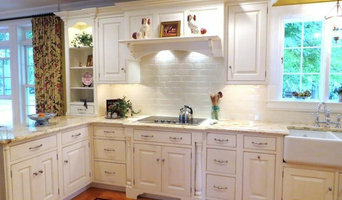 NICHEdg is a full service firm specializing in Interiors and Staging. Our mission is to help our clients realize their goals and dreams by creating innovative solutions through design. At NICHEdg, having a deep understanding of and building relationships with each client is a core value. We believe in earning the trust of our clients through our commitment to excellence, our process and having a strong ability to translate their wishes into reality. Beautiful, casually sophisticated spaces that function just as well as they look is what we create with every NICHEdg design. DesignDot was born from an idea that design should be fun, affordable and personal. Creativity and innovation stems from the relationship between designer and client. We offer several tiers of services, specifically tailored to accomplish the varied goals of our customers. The surprises should come from the inventive approach to creative, not from budgetary demands. Our unique use of technology and shared media will provide clients with a visual roadmap of current and future projects. We aim to provide each client with a comfortable means of purchasing goods under the careful guidance of a trained professional. We recognize that many of our clients may already be eager design consumers utilizing online sources. We too have embraced current technology and can quickly synthesize ideas into a customized design plan. Great design should be attainable for every budget. DesignDot designers are trained to meet the specific needs of each individual client. Our tiered programs offer a structured approach to our services that are specifically adapted to the client’s goals and expectations. The best way to serve our customers is by partnering with them to develop an overall aesthetic that showcases their own design philosophy and personality. At DesignDot, our hope is to provide a foundation for continued design inspiration for all of our clients. Get Decorated is a fully comprehensive Interior Design and Decorating service managing projects of all sizes and budgets across the country. From sourcing and arranging furniture to full renovations in residences or small offices, we can do it all. Led by principal Lindsay Biondo, Get Decorated offers a client-catered style and specializes in finding modern and contemporary solutions within all budgets. There is no project too small or large as we believe Interior Design and Decorating should be an accessible service to all. We especially love to practice the design of small spaces in urban environments, family-friendly homes and curated retreats for young professionals. Get Decorated has grown immensely over just a couple of years and continues to push the envelope by researching European trends, mixing design styles and challenging our clients to think outside of the box. Get Decorated is driven by the fun and approachable process of our team and most importantly, the passion of our clients. Let's chat today about your next project! CHRISTY KOHLER Ever since I was a young girl, design was my passion. I came to New York in 1990 for a job in International telecommunications – first as a software engineer and then sales and marketing. While traveling the globe, I saw many exotic beautiful places, but it was eventually the spaces of New York - Soho, the East Village - that I fell in love with. My passion for creativity was rekindled, and a new venture called...... Armed with a degree in Interior design, the discipline to follow through on a vision, and the gift of visual conceptualization, I founded CK Design. Whether designing commercial or residential spaces, I find the optimal use of a space. With each design decision – scale, color, and texture - I create a room that is balanced and soothing, a workplace that is comfortable and productive. Clean lines, sophisticated color palettes, sumptuous textures, and bold lighting mark a CK Design space. Designing a space which is both visually comfortable and leaves my clients feeling like their best self is my expertise. My greatest reward is helping clients define their style and discover where they fit on the spectrum of simple and decorated. Are you ready to create your optimal space? Awarded Best of Houzz 2019 and for the past five years Featured Designer on Apartment Therapy, HGTV, & Elle Decor. From decorating homes to gut renovations, we work to make our clients' homes both welcoming and beautiful. Jarret has clients throughout the country, and focuses primarily in New York, Hawaii and Miami. Every home offers an opportunity to create harmony and beauty. Jarret's goal is to create a personalized living experience that resonates with and enhances how you live. The foundation to designing a livable solution is by understanding what is most important to you. What isn’t working for you? What do you wish for? What would make you happy? From that point, we then take an inventory of your own personal collection: what has meaning and resonance? Then we can begin to build around those items. From one-of-a-kind vintage or exotic overseas pieces to familiar American or items from antiquity, Jarret incorporates both classic and modern objects to balance, weave and construct your space. Jarret delivers to you a comfortable, customized home that will remain timeless, personal and appealing — a source of enduring beauty, tranquility and happiness. Jarret Yoshida Design promises to evoke a feeling of accessible indulgence, luxury and well-being — for real, everyday living. Jarret’s vision combines sophisticated elegance and relaxed ease, a classic approach that is personalized for each client. Jarret is an interior designer who has traveled the world to develop his distinct style. Studying internationally and at design schools, his work developed a formal cosmopolitan poise, while he remains deeply inspired by the quiet harmony of Japanese æsthetics and the warmth and welcome of his Hawaiian childhood home. His designs reflect this unusual combination of experiences. Lisa Weiss began her career in design 15 years ago, designing luxury retail and hospitality spaces for Bliss Spa, Barneys New York, Ralph Lauren, and Saks Fifth Ave. Her residential portfolio includes several NYC condo designs/decorations, and full scale renovations on Long Island and Jamaica Estates, NY. Lisa's motto is that beautiful spaces should be achievable at all price points, and tends to mix a variety of elements from various sources, both luxury and mainstream. We look forward to working together to help make your home an enjoyable, beautiful space. Lisa Weiss Interiors, llc is a full service design and decoration studio located in the tri-state area. Your home can be inviting, reclusive, calming, energizing, modern, old world - whatever you want or need it to be. At Grace Rosenstein Inc (GRI), our biggest responsibility is to make sure our client's lifestyle is reflected in their spaces. Every project is a unique design puzzle and we're always up for the challenge. GRI is a full-service interior design firm with offices located in Westport, CT and New York City. We pride ourselves on our creative design development, practical process and transparent communication to deliver all phases of our projects from concept to reality. In addition to our tasteful designs, our ability to execute against goals, budgets and timelines sets us apart. GRI's style has been described as classic, refined, and elegantly modern. We are a residential interior design and decoration company founded by interior designer and former decorating editor Davida Hogan. Our specialty is transforming your home into a space that looks like the pages of a decorating magazine. Contact LM Interior Design and let's get started! I bring over 30 years of experience and education to your doorstep, for you to enjoy in the comfort of your home. Design solutions often begin with our first meeting. Homeowners have asked me, “How do I put my renovation plans in action, while staying on budget and having all my wants and needs met?” My answer is, to have ME your side! I am dedicated to managing your project and adding value to your home, while safely improving the look and feel of your space. Using my specialized process, I incorporate your vision, stay on budget and get your project done on time. Working together, WE will make your home a beautiful backdrop for your life! 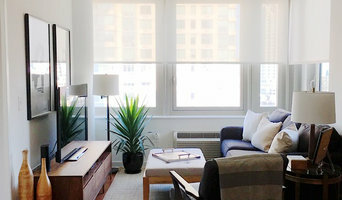 Brooklinteriors is a female owned, full service interior design company of Brooklyn. We have a personalized and community based design approach, offering fully customizable design projects with flexible pricing models allowing us to source highly unique and local artists, designers, and vendors. We aim to beautify and grow our Brooklyn community, supporting our residents and artists alike! Hello friends & neighbors! I'm Alicia Hassen, Founder and Interior Designer of Brooklinteriors. As a resident of Prospect Heights, I uncovered a unique opportunity to mutually support the Brooklyn community of interior design seekers and local artists. The story comes together with my passion and expertise in interior designs, product sourcing and project management as well as dedication and time. With Brooklinteriors, I've created completely custom interior design services priced on an outcomes-based model. We don't believe in buying hours, but rather buying an expertly executed design project that meets your goals. My dedication to your design extends to sourcing those perfect pieces including those from local artists, designers and home good vendors. My mission is to go above and beyond in every step of your project and ultimately, get it (oh so!) right, on time and on budget!